Are there instructions anywhere? Perhaps a key showing what different symbols and activity mean? I have included a screen shot of my Synergy2 page. I cannot get the left computer to connect. On that machine, there is a "working..." bar that is endlessly showing the left to right green slider. What exactly does this mean? 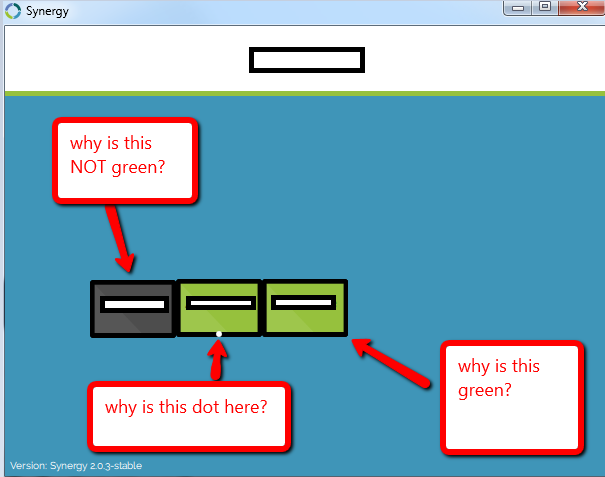 I would love to see the answers to the "why is this not green", "Why is this dot here", and "why is this green?" questions. It isn't clear to me when they should be in what states. Nevermind! I found a description on the forum!